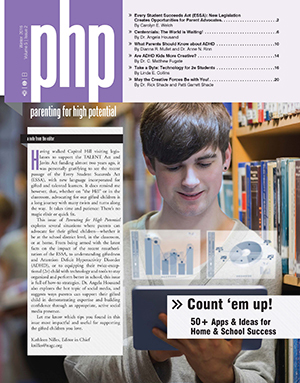 Parenting for High Potential is the magazine designed for parents who want to make a difference in their children's lives, who want to develop their children's gifts and talents, and their potential to the fullest. To receive Parenting for High Potential, become a member of NAGC today. Parent Associate members receive Parenting for High Potential four times each year. Individual members may also choose to receive the print issues. All NAGC members have access to the issues electronically. Interested in advertising? If you are interested in writing for Parenting for High Potential, refer to the writing guidelines Interested in advertising? .Find out more here.